After month of a Trudeau-mania, things seem to have become a lot tighter in federal politics. The latest Abacus poll shows a statistical tie between the Conservatives, Liberals and NDP. However, the small advantage for the party of Stephen Harper in term of votes is actually much more important when we look at seat projections. Indeed, the Tories are projected to have a 28 seats lead over the Liberals. 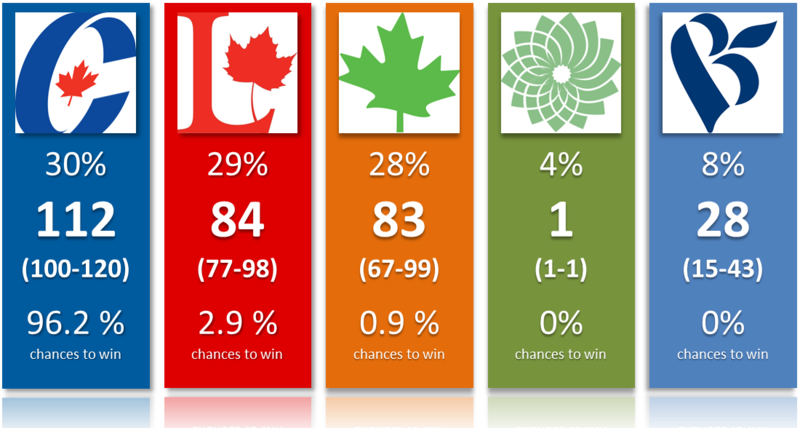 The simulations, which account for the uncertainty due to the polls as well as the electoral system, show that Stephen Harper would have 96% chances of winning the most seats. The detailed, riding-by-riding projections are available here. I'm still using the old electoral map since Election Canada hasn't published a transposition of the vote yet. How is that possible? Well, the nation-wide percentages are always misleading in this country. What really matters are the provincial percentages. And when you look at each province, you discover that the Liberals are only first in one region (the Atlantic). And even there, the NDP is just behind them [side note: the Atlantic is a region composed of four provinces and the sample size is really small. So always be careful when reading analysis for this specific region]. Everywhere else, they are either second or even third while the Conservatives are first everywhere but in Atlantic and Quebec. Also, it seems that the electoral system is slightly against the Grits. For instance in Ontario, despite being virtually tied with the Tories, the Liberals would win the most seats in this province only around 40% of the time (vs 60% for the Conservatives). It might be due, at least partially, to the division of the vote with the NDP. Another way to make sense of these numbers is to simply see that the Conservatives would still take too much of a lead in the West. When a party can win 100% of the seats in one province, like this could be the case in Alberta with its 28 seats, this gives this party a huge advantage. The Liberals (or the NDP) don't have such a province. The NDP had Quebec in 2012, but they are now down, with the Bloc and Liberals both back up. The fact that the projected lead is 28, exactly the number of seats from Alberta, is purely a coincidence here, but it is symbolic nonetheless. For the NDP, this poll is a mixed of good and bad news. In Quebec, they now have the Bloc right behind them. But, on the other hand, they are barely behind in Ontario, the Atlantic or BC. Still, being a close third doesn't usually translate into a lot of seats in our electoral system. If they want to be a real contender next election, they'll need to first secure Quebec and then move to Ontario. Still, the simple fact that the NDP is projected with some chances to actually win the election is something most people could have never imagined just 5 years ago. The bottom line is that Stephen Harper and his party won't be easy to beat. They now seem to have a slight edge with the electoral system, most likely due to having won many elections in a row. They face a real opponent with Trudeau of course, but as long as they can prevent him from taking the lead in Ontario, they should be able to keep the power.